For these reasons, many people in Virginia wish to have nuisance Flying Squirrels trapped and removed. Normal habitat is inside tree cavities in hardwood forests. 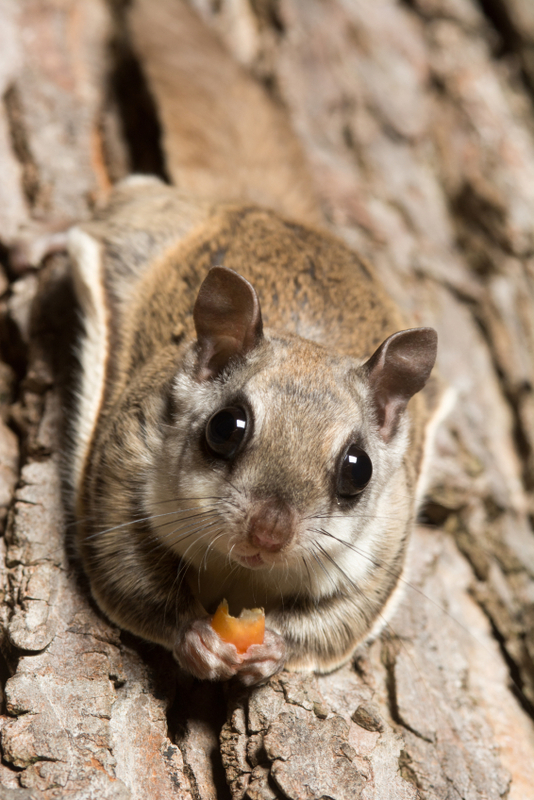 Flying squirrels are smaller than the grey squirrel, often entering homes through the smallest of cracks and holes. They are about 9 inches long, which includes a 3-4 inch long tail. They typically weigh about 3 ounces as an adult. The have a dense soft brown fur and a white belly. Flying squirrels in Virginia don’t really fly, but glide into attics from trees. They do this by means of a thin skin that extends out from the sides of the body and connects the front and hind legs as shown in the above picture. In “flying,” the squirrels leap spread-eagle and use their outstretched gliding membranes for gliding and their bushy tails for guidance. Flying squirrels have been recorded gliding 60 meters (almost 200 feet). Flying Squirrels in Virginia can enter the attics through the eaves and soffits thru small cracks. These squirrels may easily enter the space between the roof top, attic vents, soffits and fascia boards, chewing the area for a wider entry point. These squirrels chew on ornamental and potted plants. Damages screens. They may gnaw on wood, electrical wiring and insulation causing fires. Flying squirrels in VA are nocturnal with their major activity at night. They are known to make plenty of noise during the night. They can be commonly heard making a great deal of noise at night between sunset and sunrise, and are often heard landing on the roof or the sides of the house. Normally have 2 litters a year, 2-4 young per litter. Will seek shelter and a hiding place, likes to hide in the insulation. When trapping for these squirrels: place the traps in the attic, where they are commonly found. Flying squirrels are small and clever rodents that will spend the majority of their lives going from tree to tree when they are living in their natural Virginia habitat. However, there are a number of instances where flying squirrels can find their way into Virginia homes, and when this happens they will usually have found their way into the attic or roof cavity of the property. There are a number of issues that can be caused by such a flying squirrel infestation, including hygiene and health issues as well as the scratching and scampering noise that will often be heard from the attic of Virginia homes. It can often be difficult to tell the difference between a regular grey squirrel infestation and having flying squirrels in the attic of your home unless you actually go into the attic to search for the animals. Flying squirrels in Virginia are generally smaller in size than the Eastern Gray squirrel, and typically live in large communal groups. If you’re not able to access the attic space yourself, then a visual examination of the soffits and fascia boards around the base of your roof will often indicate a number of golf-ball size holes that are used by flying squirrels in Virginia as entry and exit points. Once you have confirmed that you have an infestation of flying squirrels in your Virginia home, then there are a couple of options that can be used to try and get rid of these animal pests. The most common approach used by Virginia professional wildlife removal companies dealing with a flying squirrel infestation is to seal most flying squirrel entry and exit points, leaving only one or two exit or entry points for the squirrels to use. Once these have been sealed, then a one-way exit can be put in place. Some of the wildlife experts will actually have the exits leading into a repeater trap to actually catch all of the animals, while others will simply allow the squirrels to exit the home. While these one way doors are effective, we find that untrapped flying squirrels will often chew new holes in your home. We DO NOT recommend the use of one-way doors for any animal. It is also worth going in to the attic space to check the area so that you can be certain there are no flying squirrels or babies remaining in the attic. The most important thing to do once the flying squirrels have been removed is to seal the attic to make sure that no others can get into the attic of your Virginia home. Flying squirrels in Virginia often will follow the scent of other flying squirrels, so if one flying squirrel can find their way into your attic then others are sure to follow unless all entry points are sealed. For this job it is often best to hire a professional wildlife removal company in Virginia to examine your attic and to repair any holes or weak points where other flying squirrels could enter. It is also a good idea to have a professional decontaminate the attic to prevent any health issues being caused by the feces and urine of the flying squirrels in Virginia. Most homeowners don’t know they have flying squirrels until they hear noises overhead. Flying squirrels are mostly nocturnal, and can be distinguished from regular squirrels by their large, orbital eyes. Flying squirrels are often mistaken for infant grey squirrels due to their small size, lack of tail fluff and generally calm demeanor. Because these critter are active at night, Virginia homeowners often discover a problem when their sleep is interrupted by strange noises in the attic, walls, ceilings and crawlspaces. Unlike many other types of squirrels, flying squirrels in Virginia are generally less destructive to the home. Their nuisance qualities have to do with the mess which accompanies their communal toilet or latrine areas. They are also social animals, often living in groups of eight or more. Eight squirrels stomping around overhead can make quite a ruckus. They are also known to chew on wood and wires in an attic. Contact us for additional information on Hot to Get Rid of Flying Squirrels in Virginia attics and flying squirrel removal in VA. Despite the differences between flying squirrels and regular squirrels, both species will live in Virginia homes regardless of food sources nearby. Homes next to wooded lots and state forests are often most susceptible to flying squirrel infestation. All it takes is one golf-ball size hole in the exterior of your home to provide flying squirrels access to the inside structure. Flying squirrels in Virginia are often smaller than grey squirrels and require even less of an opening to squeeze through. The best defense against a flying squirrel offense is to routinely maintain the outside of your Virginia home. By patching all holes along the roof line, you are preventing flying squirrel infestation from getting started in your home. Since flying squirrels are exceptional climbers, care must be taken to check eves, overhangs and roof outcroppings closely. One missed crack, hole or other golf-ball size opening can result in flying squirrels moving into your home. Once they are inside your Virginia home, flying squirrel removal in VA can become complicated. Many people panic and attempt to address the problem by using poisons. Poisons will kill a flying squirrel; however, what happens next is often the cause of much more anxiety and stress for the homeowner. Poisoned flying squirrels do not usually die immediately. Remember, too, that they are communal animals. If one is poisoned, all eight may be poisoned as well. These eight furry bodies are going to retreat into the safe, tight spaces of your home where they will then die. The smell of decaying flying squirrel carcasses will linger inside the home until the bodies are removed. Unlike smaller animals such as mice, a flying squirrel body (and those of multiple flying squirrels) will take longer to decompose. Waiting for the dead animal smell to “go away” may not be realistic in this situation. Many commercial wildlife removal and pest control companies in Virginia will try and dupe the homeowner into buying a stack of repellents and deterrents to address their flying squirrel problem. Fake owls, predator urine, vibration and ultrasonic emitters, predator sounds and chemical sprays are all options on the open market. Home remedies, like the use of mothballs, also exist. All of the above have been proven useless during field tests. If you think about your own response to stimuli, you’ll understand why many of these are ineffective. Fake owls and predator sounds, smells, or decoys are fakes. It won’t take a flying squirrel in Virginia long to figure out that “danger” is not real. Just as we know a fake when we see one, so does a flying squirrel. Ultrasonic emitters have never been proven to be efficient, and most professional wildlife removal and animal control companies in Virginia will attest to that fact. Mothballs and other home remedies are not potent enough to be used in large areas, and most nuisance animals will simply avoid the toxin’s immediate location. Flying squirrels removal and control in Virginia is most effective when the animals are trapped and removed from your home. Trapping flying squirrels can be accomplished with a live trap or a humane lethal flying squirrel trap. These traps use a lever system to quickly and humanely kill a flying squirrel. Be sure to buy large traps and bait them with something the flying squirrel will be attracted to. Leave the traps baited and unset for a few days. Once the flying squirrels have gotten accustomed to regularly feeding from the traps, activate the traps and wait for the flying squirrels to be caught. Remember that flying squirrels in Virginia live in communities. Trapping one flying squirrel will not eliminate your problem. As there is no definitive way to determine the size of the colony, you must keep your traps set until all signs of the flying squirrel infestation have abated. Complications often occur when traps are taken away too soon or when infant flying squirrels still dependent on their mother for survival are left behind to decompose behind walls. Improper trap size will also be a detriment. Flying squirrels that are trapped, but not killed may drag the trap into the wall where the animal will eventually die of starvation or from its injuries. Flying squirrels in Virginia inhabit wooded areas and make their nests/dreys in all different types of places. The most common nest is in the cavity of a tree, bird’s nests, bird houses and in the attics of homes and businesses. Flying squirrels in Virginia are very small squirrels that can be gray, white or brown. They are known for the webbing that is attached to its belly and connects all the legs that gives it the unique ability to glide between the branches of trees, and this is how it got its name. Generally speaking, flying squirrels in Virginia are omnivores and will eat a variety of insects such as; spiders, beetles, slugs and moths. They will also eat many different plants such as flowers, moss, lichen, mushrooms, bark and nuts. They also enjoy eating fruits, nuts, tree sap and bird eggs when the opportunity arises. Flying squirrels are classified as scatter hoarders; this means that they hoard their food in many different spots surrounding the main living area, and this behavior is meant to increase food security. The life expectancy for a flying squirrel in Virginia is six years, and can extend to fifteen years if they are held in captivity. The reason that flying squirrels’ lives are cut short when they are in the wild is that they are a favorite prey animal. The main predators for the flying squirrel are: foremost is the owl, raccoons, coyotes, weasels, tree snakes, ground snakes like rattlesnakes and house cats. However, flying squirrels have very finely honed senses to protect against these predators. 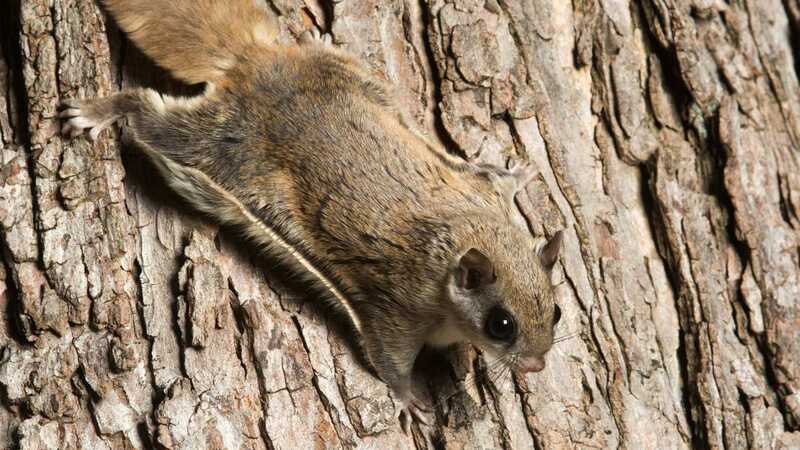 Firstly, the predators of the flying squirrel use sound and movement to detect them and the flying squirrel responds by “freezing” and thinking about its escape route. Flying squirrels in Virginia know their home area very well and will glide to the nearest refuge when they sense danger. The only time that this is not true is when the flying squirrel is in its juvenile stage. This is the time in a flying squirrels life when it is in the most danger of being killed because it has not yet learned the terrain like the adult flying squirrels. The mating season for flying squirrels in Virginia is in the early spring. The usual litter size is 1-4 young per female every two years, but the number depends on the size of the forest. For example, flying squirrels who live in larger forests will have larger litters. This gives the mother flying squirrel plenty of time to wean her young before the bitter winter sets in. When a flying squirrel is born it is defenseless; it has no fur and the organs are still developing. After 5 weeks the babies will have their fur and will be ready to start learning how to hunt and glide. The male is not present at any time during the raising of the litter. The flying squirrel in Virginia has long been mistaken for bats. Be aware that these squirrels do not fly like bats but glide and jump so it only appears that they are flying. 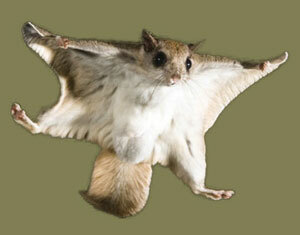 Some flying squirrels can glide for over 1,400 feet! While these squirrels are adorable, they do not make good pets. The only suitable place for these furry gliders is in a forest or in a zoo – Not in the Attic of Your Virginia Home! Flying squirrel removal in VA is our specialty. We are the areas leading flying squirrel removal company. If you are having problems with flying squirrels, bats, raccoons, grey squirrel, mice, rats or other critters in your Virginia home call us at (804) 457-2883 or visit us on the web at www.richmondanimalremoval.com. 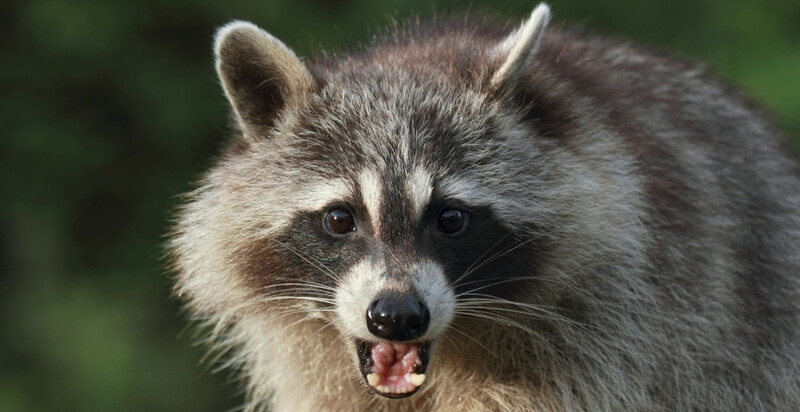 We remove, control, capture and trap bats, birds, beavers, bobcats, coyotes, foxes, geese, groundhogs, mice, moles, opossums, pigeons, raccoons, rats, skunks, snakes, sparrows, squirrels, starlings, voles, woodchucks and other critters in Virginia – safely and humanely. Click on the link below for a Virginia professional flying squirrel removal specialist in your area. Don’t see your Virginia city, town or county listed for flying squirrel removal? Call us at (804) 457-2883 or toll-free at (877) 828-3878. 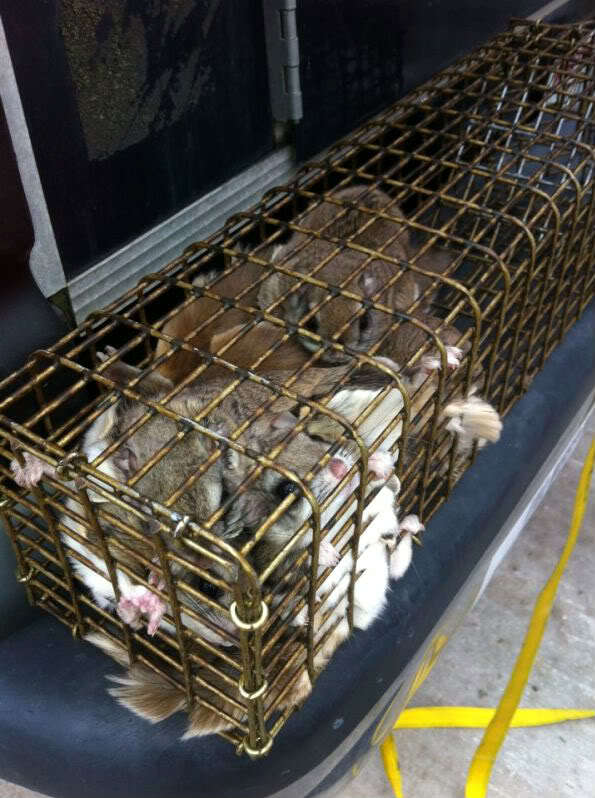 For the best flying squirrel removal in Virginia – call us toll-free at (877) 828-3878 for humane animal removal, animal capture, animal control, animal trapping and animal management of all wildlife pests.